PerryGolf is proud to again partner with Azamara Club Cruises for an exceptional golf voyage onboard the outstanding 690-guest Azamara Quest around the alluring and exotic Arabian Gulf. This region offers incredible history, culture, food, and shopping, and will deliver a truly once in a lifetime experience to guests fortunate enough to participate. Our embarkation and disembarkation port of Dubai also offers easy ... Read More. air access with nonstop service from many cities of the world. Experience Dubai’s over-the-top opulence at the Burj Al Arab hotel and Gold Souk. Admire the beautiful beaches in Khor Al Fakkan. On Sir Bani Yas Island take a ride through the Arabian Wildlife Park or visit and on-going archaeological excavation. Make your way to the Souq Waqif in Doha, the renovated Arabic market quarter. In Abu Dhabi, don’t miss Sheikh Zayed Mosque, an astounding monument that rivals the Taj Mahal. You’ll be impressed by three new museums which opened in 2015-2016: the Louvre, Guggenheim, and Zayed National Museum. Our golf program will also delight. This region boasts some of the finest golf facilities in the world, with outstanding layouts and the highest of service levels. Our planned lineup includes the highly rated Yas Links and Saadiyat Beach in Abu Dhabi, the private Royal Golf Club in Bahrain, and the Majlis Course of Emirates Golf Club in Dubai, annual host venue to the European Tour’s Dubai Desert Classic. Our sailing schedule also ensures you will enjoy quality sightseeing time at these destinations in addition to playing these fine golf courses. PerryGolf’s cruise staff will be on board and ashore to oversee all aspects of your golf experience from daily pairings to the handling of your golf clubs. Azamara Club Cruises Destination Immersion® itinerary offers various overnights and late evenings in port assuring that you will be able to enjoy the allure of the various ports by evening, to experience the varied and exotic cultures at each of our destinations. Back on board you will be able to enjoy the facilities of the stunningly upgraded Azamara Quest, in the company of a PerryGolf guest list which typically brings together like-minded individuals sharing a love of golf. Inevitably many new friendships are formed. Many guests are golfing couples but an equal number are golfers travelling with a non-golfing spouse. The latter are also exceptionally well catered for as, in addition to the fabulous onboard facilities, a wide selection of Azamara Land Discoveries® are offered in each port. The itinerary also allows for some relaxing “sea time” under blue Arabian skies. On board, our guests are absolutely spoiled. Azamara Quest is small enough to provide a most intimate experience and nimble enough to access smaller ports, but large enough to provide a great choice of outstanding dining and bars; the ship also offers an exceptional full service spa, and features excellent and varied evening entertainment. In addition to all “normal” cruise features, Azamara Club Cruises include all soft drinks, specialty coffees, boutique daily wines, and a choice of select standard beers and cocktails within the cruise fare, plus all gratuities to create a thoroughly all-inclusive cruise experience. Just read what our past guests say. We know you will love it! Embark Azamara Quest from 1:00PM onwards. Welcome Cocktails & Briefing this evening and a chance to meet your fellow participants. Abu Dhabi is the capital of the United Arab Emirates and is the largest emirate by area. It is home to the seat of government, the Al Nahyan royal family, and a population of approximately 20% Emirati citizens and 80% expats. Its commitment to local culture and heritage, combined with international influences, is what makes Abu Dhabi an intriguing, exciting, and hospitable mix of new and old. Be sure to visit Sheikh Zayed Grand Mosque with 82 domes, 24-carat gold-gilded chandeliers, and the world's largest hand-knotted carpet, it’s a stunning place of worship. Go for a stroll along the waterfront of Corniche Road—which features separate pedestrian and bike paths, restaurants and cafés, and Corniche Beach—enjoy a desert Jeep safari, or shop to your hearts’ content at the many upscale malls and local souks throughout the city. GOLF: Yas Links was designed by renowned course designer Kyle Phillips. Built on Yas Island, the course was almost 3 years in construction and used 2 million cubic metres of dredged sand to cap the land. Despite its relatively young age, Yas Links is proving to be one of the best courses in the region. Situated just across the highway from the Yas Marina Formula 1 track, the course utilizes the natural surroundings and weather conditions to create a truly wonderful links test that will excite all levels of golfers. 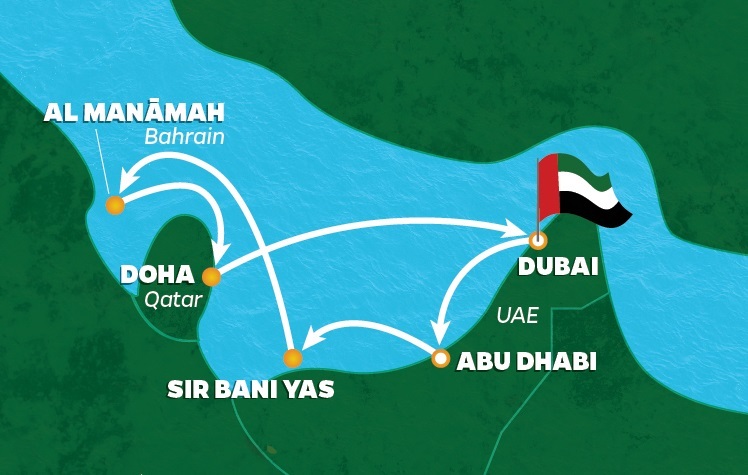 Sir Bani Yas is a natural island and the largest island in the United Arab Emirates. The name originates from the Bani Yas tribe who first inhabited Abu Dhabi. The island was originally the home to Arabia’s largest wildlife reserve which was established in 1977. Now, Sir Bani Yas showcases nature through activities such as adventure safaris, kayaking, mountain biking, archery, hiking and snorkeling, and was recently awarded the ‘World’s Leading Sustainable Tourism Destination’ at the 2014 World Travel Awards. The island is also home to UAE's only discovered Christian monastery. Believed to have been built around 600 AD, and abandoned in 750 AD, the monastery was initially discovered during excavations in 1992. Al Manamah is one of the Arabian Gulf’s important trading centers, the port of Al Manamah (or Manama as it is often referred to) is the capital of Bahrain and home to a very diverse population, with Portuguese, Middle Eastern, and British influences evident throughout the centuries. It’s also home to one of the largest mosques in the world, the Al-Fateh Mosque, the UNESCO World Heritage site of Bahrain Fort with excavations that date back to 3000 BC, and the Tree of Life, a famed lone tree that thrives in the middle of a dry desert, making it a complete mystery to modern science. Outdoor activities here include dolphin watching, scuba and pearl diving, and bird watching; and with alcohol permitted in Bahrain, Al Manamah—and its accompanying nightlife—is a popular destination for locals and expats alike. GOLF: Royal Golf Club Bahrain was designed by Colin Montgomerie and hosted the European Tour’s inaugural Volvo Golf Champions tournament in January 2011. The Montgomerie championship course offers a unique blend of links and desert golf, taking advantage of Bahrain’s natural rough desert terrain and combining it with vast manmade lakes. The desert feel is retained through the use of sandy waste bunkers and the attractive indigenous vegetation and grasses used in the landscaping. The rolling links-style fairways and undulating greens are immaculately maintained. Doha is the capital of Qatar, a bustling and cosmopolitan city which has undergone rapid economic expansion, as evident by stunning new buildings, resorts, and sporting venues, not to mention fantastic shopping malls and revitalized souqs. One of Doha’s premier highlights is the waterfront promenade Al-Corniche, showcasing Doha Bay, city skyscrapers, and Palm Tree Island. In its efforts to become a regional hub of culture, Doha has also built a number of museums such as the Museum of Islamic Art. In addition to featuring Islamic art from three continents spanning 1,400 years and being designed by renowned architect I.M. Pei, it’s also home to the restaurant IDAM by legendary chef Alain Ducasse. Dubai may already be mistaken for a movie set featuring a futuristic metropolis, and even greater plans are in the works. Located in the middle of the desert where almost nothing existed 20 years ago, there are so many building projects that foreign construction crews vastly outnumber citizens. Everything is the biggest, tallest, and the first of its kind, including manmade islands shaped like palm trees and the world’s first underwater hotel. It’s a striking collection of styles, including modern interpretations of ancient architecture. Consider a visit to the top of Burj Khalifa or the Souk Al Bahar, an Arabesque shopping mall located in the heart of the prestigious Downtown Burj Khalifa, on the Old Town Island. GOLF: Emirates Golf Club, Majlis Course* is annual home to the European Tour’s Dubai Desert Classic, and enjoys a worthy reputation worldwide as an excellent layout. The course features hundreds of indigenous species of flora and fauna, beautifully complemented by meandering fairways and seven fresh and saltwater lakes. The Majlis which was the first grass course in the Middle East takes its name from the Arabic word for 'meeting place'. One of the most prominent features on the course is the Majlis building itself positioned between the 8th and 9th holes and a Dubai landmark since 1988. *Play at The Emirates Majlis course will be walking with caddies. It was designed as a walking course. Caddie fees and tips covered by PerryGolf. No carts permitted during this time. Guests who require a golf cart will play The Emirates Faldo Course. Yas Links was designed by renowned course designer Kyle Phillips. Built on Yas Island, the course was almost 3 years in construction and used 2 million cubic metres of dredged sand to cap the land. Despite its relatively young age, Yas Links is proving to be one of the best courses in the region. Situated just across the highway from the Yas Marina Formula 1 track, the course utilizes the natural surroundings and weather conditions to create a truly wonderful links test that will excite all levels of golfers. Saadiyat Beach Golf Club boasts the first ocean front course of the Arabian Peninsula. Designed by Gary Player it is located on Saadiyat Island and set along an azure coastline. The imaginative golf course routing provides a spectacular variety of golf experiences with every hole having its own unique character. From the creation of an aquatic habitat, to the introduction of salt-water lagoons, restoration of the beach and sand dunes, the course has been designed with strict environmentally friendly guidelines and a true sensitivity to the surrounding natural environment. Royal Golf Club Bahrain was designed by Colin Montgomerie and hosted the European Tour’s inaugural Volvo Golf Champions tournament in January 2011. The Montgomerie championship course offers a unique blend of links and desert golf, taking advantage of Bahrain’s natural rough desert terrain and combining it with vast manmade lakes. The desert feel is retained through the use of sandy waste bunkers and the attractive indigenous vegetation and grasses used in the landscaping. The rolling links-style fairways and undulating greens are immaculately maintained. Emirates Golf Club, Majlis Course* is annual home to the European Tour’s Dubai Desert Classic, and enjoys a worthy reputation worldwide as an excellent layout. The course features hundreds of indigenous species of flora and fauna, beautifully complemented by meandering fairways and seven fresh and saltwater lakes. The Majlis which was the first grass course in the Middle East takes its name from the Arabic word for 'meeting place'. One of the most prominent features on the course is the Majlis building itself positioned between the 8th and 9th holes and a Dubai landmark since 1988. Emirates Golf Club, Majlis Course is annual home to the European Tour’s Dubai Desert Classic, and enjoys a worthy reputation worldwide as an excellent layout. The course features hundreds of indigenous species of flora and fauna, beautifully complemented by meandering fairways and seven fresh and saltwater lakes. The Majlis which was the first grass course in the Middle East takes its name from the Arabic word for 'meeting place'. One of the most prominent features on the course is the Majlis building itself positioned between the 8th and 9th holes and a Dubai landmark since 1988.